Rayman 2 is an all time classic game that I used to pay as a kid on Play Station. Rayman over all is an all time classic but the second game was my favorite. I would play it for hours on end without stopping. The main reason why I loved this game so much was because it was one of the games that was mine. Only mine, a game that I didn't have to borrow off one of my brothers for once. But other than it being mine I'll tell you why it's such an awesome game and why you should play it sometime in your life. The game was released in 1999. It's about a time not long after Polokus the god and spirit of a newly created planet. There was an army of Robo-Pirates that led by Admiral Razorbeard taking over and enslaving the planet, whilst holding the captured inhabitants in the pirates prison ship The Buccaneer. Eventually, Rayman and his friends get captured but with some help from his best friend Globox they escaped. But they got separated in the process, as he progresses along in search of help from Ly the fairy, he learns that the pirates have broken the heart of the world. The world's core, all into 1000 lums that have been scattered all over the planet. Which has weakened the world as a result. It's all up to Rayman and whatever help he can get to collect these lums but more importantly retrieve the 4 legendary masks that are said to awaken the Great Polokus. The planets greatest hope to exterminate the Robo-Pirates and once again save the world. You start the game playing as Rayman himself but as the game goes on there is also a chance where you get to play as Rayman's best friend Golbox. The game is a fun adventure - fantasy game where you explore loads of different places collecting items and saving people along the way. It is a game that I would so recommend you guys to play, it's fun and really challenging at times. Also, if you have any kids that love video games. This game is a great classic kids friendly game. It will really make you feel for the adventure and strive to the end result. 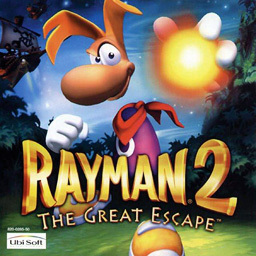 If you love old classic games like me, then Rayman 2 is one of them. Comes along in the same catagory as Spyro andCrash Bandicute. So if you liked those games then you will love this one. Also, the art design is beautiful, if you want to see some click on here and it will send you right to a video showing you just that. So there are my thoughts about this awesome game! I would love to hear your thoughts in the comments. If you haven't played this game before what classic game would you recommend me to try out and play for myself?